So you're planning a visit to the Wizarding World of Harry Potter, but you don't know where to start. Friend, I've been there. I'm a Harry Potter fanatic, and I couldn't wait to immerse myself in all things magic with my sister, a fellow HP geek. I discovered that as I began to plan our trip, though, a lot of questions came up. Which park is the Wizarding World of Harry Potter in? What tickets to I need for Harry Potter world? Is it possible to do the Wizarding World of Harry Potter in one day? Now that I've experienced it for myself, I'm here to help. There are a few insider tips and tricks to know before you go. The more you know, the easier it will be to plan your trip, from what kind of ticket to buy, to whether you need the express pass, to which rides, shops, and restaurants to prioritize. My sister and I had one day to see all of the Wizarding World of Harry Potter, and that was plenty of time. Here are my top tips and things to know to prepare for your memorable trip to Universal Orlando's Wizarding World of Harry Potter. WHICH PARK HAS THE WIZARDING WORLD OF HARRY POTTER? The Wizarding World of Harry Potter (WWHP) is divided between Universal Studios and Islands of Adventure parks, which means you'll want a Park-to-Park ticket. Diagon Alley, the Knight Bus, and 12 Grimmauld Place are located in Universal Studios. You'll take the Hogwarts Express between parks. Hogwarts and Hogsmeade are located in Islands of Adventure. Remember, you MUST have a Park-To-Park ticket to ride the Hogwarts Express which takes you between parks. If your goal is to see as much Harry Potter as you can, then the Single Park Ticket is not worth it! DO I NEED AN EXPRESS PASS? The Universal Express Pass lets you skip lines at many of the rides and attractions in Universal Studios and Islands of Adventure. You get to bypass much of the queue, but at some point, you will merge with the regular line and end up with a few minutes' wait (probably around 5-10 minutes). Each rider needs their own Express Pass. Also, it's worth noting that before each ride, you are required to store your belongings in lockers (which are provided for free), so you will have to carry your pass, which is a fairly flimsy piece of cardstock with you on the ride. If you don't have pockets (like me) you will have to carry the card with you while you're on the ride. It really wasn't that big of a deal, but it is something to keep in mind. Is the Express Pass worth the money? Well, a 2-park 1-day pass is $99/person. Full Disclosure: my sister and I received an Express Pass for free from Universal Orlando to help facilitate my articles for TravelPulse (here and here), so I'll try to write this as objectively as possible. When we were there, we both gushed that the Express Pass was SO NICE to have, as we could just walk on almost any ride INCLUDING the Hogwarts Express. It made our day so much smoother and we were able to fit in as much as we wanted to do. Looking back now, I think I would buy the express pass again if I were going again and paying my own way. 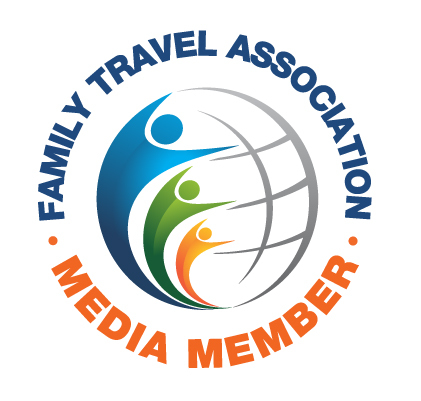 However, if I were with my whole family, I don't know that I would shell out the money for Express Passes for our whole family. HOWEVER, there are 2 caveats here. 1. If you are staying at one of Universal Orlando's hotels, you get FREE Universal Express Passes for each guest, and 2. an alternative to the Express Pass would be to use the single rider line to bypass much of the queue. You'll get to wait in line together, but you'll just be separated on the actual ride to fill in single open seats. We decided to start in the Universal Studios park, home of the Knight Bus, Number Twelve Grimmauld Place, and Diagon Alley. I'm glad we did it, because we felt like Harry Potter himself, experiencing Diagon Alley and getting our wizard gold and supplies before heading to Hogwarts. First thing in the morning we made our way straight back to the Knight Bus. There was virtually no line, and we got to chat with Stan Shunpike and take our picture with him. 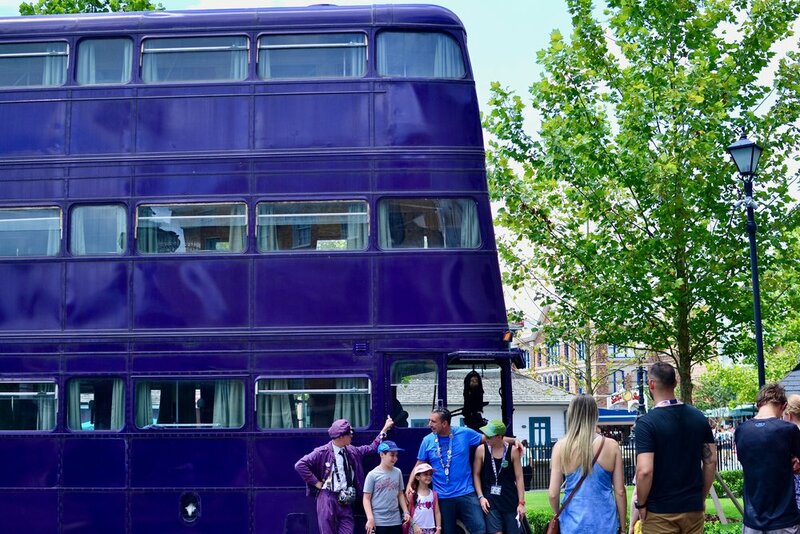 You won't miss it - it's the giant three-story purple bus right across from King's Cross Station in what looks like downtown London. From there we wandered over to Number Twelve Grimmauld Place and noticed Kreacher the house elf peeking out of the top window. We also saw a red phone booth but didn't realize that you could go inside and dial MAGIC to get the Ministry of Magic. Next, head into Diagon Alley. There's a brick wall next to King's Cross Station that looks very unassuming, but right behind it is a magical world filled with shops, restaurants, and Gringott's Bank. Once inside, you'll find myriad shops straight out of the books and movies such as Weasleys' Wizard Wheezes, Madam Malkin's Robes for All Occasions, and Quality Quidditch Supplies. Really take some time to look around and notice all the attention to detail. I'm kind of regretting not buying a Gryffindor Quidditch shirt. Take a stroll down Knockturn Alley (walk all the way to Gringotts then turn left. It's the dark alley at the end of the road) to find Borgin & Burkes, and be sure to find the disappearing cabinet Malfoy used to smuggle Death Eaters into Hogwarts! Our favorite spot to eat in Diagon Alley was The Hopping Pot. It's kind of hidden off in a corner, so just look for all of the picnic tables behind Eternelle's Elixer of Refreshment kiosk. We wanted to try butterbeer right away, (in fact, it was our main priority), so this walk-up counter was perfect for that. They offer butterbeer in 4 ways: hot, cold, frozen, and ice cream. We tried cold and ice cream, and loved them both! 2 main experiences stand out in Diagon Alley. The first is relaxing with a butterbeer and enjoying The Tales of Beedle the Bard acted out by members of the Wizarding Academy of Dramatic Arts. We caught the telling of The Tale of the Three Brothers (think Deathly Hallows), and I was honestly captivated. The other experience you'll want to take part in is exchanging your money for wizard gold at Gringotts Money Exchange. This is different from Gringotts Bank with the dragon on top - that's where the ride Escape from Gringotts is. You can use the wizard gold anywhere in Universal Orlando parks, and the goblin inside the shop will even interact with you if you ask him a question! The only ride in Diagon Alley is Harry Potter and the Escape from Gringotts, a fun motion simulation thrill ride through the bank's underground. We had a blast on this ride, and I would happily have ridden again if we had time. If you're with your kids, minimum height is 42", and they also have Child Swap available for this ride. When you're ready to leave Universal Studios and head to Islands of Adventure, queue up at King's Cross Station to climb aboard the Hogwarts Express. Apparently, there's a spot where you can get a picture and video of yourself walking through platform 9 3/4 which we missed (I'm devastated. I don't want to talk about it), so make sure to ask a staff member if you don't see it! Once you're in your compartment, enjoy the "views" out your window of Harry Potter characters and scenes from the books and movies. The train will drop you off right outside Hogsmeade Village. Right when you enter Hogsmeade you'll see Hogwarts rising up majestically to your left, and a bustling village of shops and restaurants before you. Even if you're melting from the 95° heat, the fake snow atop the village roofs will make you feel like Harry, Ron, and Hermione visiting at Christmastime. In the middle of Hogsmeade is a small stage where the frog choir performs some wizarding songs, or the Beauxbatons and Durmstrang students perform for the Triwizard Spirit Rally. As I mentioned, you can also experience the wand selection ceremony at Olivanders. The first ride you'll find is Flight of the Hyppogriff which takes place by Hagrid's hut. You can imagine you're in Care of Magical Creatures class as Hagrid teaches you the proper way to approach a Hyppogriff. This is a roller coaster, but it's a really short and really tame roller coaster (but still fun!). So short, in fact, that it's not really worth waiting in line a long time. It's an enjoyable ride, though, and worth if you have an Express Pass or the line's not too long. Minimum height is only 36", so it's very family-friendly. The other ride is one of my new favorite theme park rides. It's called Harry Potter and the Forbidden Journey and it's an amazing ride on a broomstick over the Hogwarts grounds. It takes place inside Hogwarts castle, which actually makes your wait in the queue really fun as you take in the talking portraits and nooks and crannies of the castle. Forbidden Journey is a simulation 3-D ride, and it feels like you truly are riding on a broomstick. When you read about Harry flying on his Firebolt, you always think about how cool it would be to be in his place, and this ride actually gives you a sense of that, *and* how flying could actually be scary for some witches or wizards who aren't as gifted on the broomstick. It's such a cool ride, and so fun to see all of the magical creatures as you're flying along. Minimum height is 48", so this one is for the older kids and adults. Child swap is available if you're with little ones. We didn't actually eat at any of the restaurants here, but you can find Hog's Head and the Three Broomsticks, two legendary eateries in the series. Ask any kiosk or restaurant with a soda fountain machine for a cup of ice water and they will gladly give you one for free. We did this multiple times throughout the day and just kept filling up our water bottles. There are also water fountains near most restrooms. This is a great way to avoid paying for overpriced water bottles, because, trust me, you will get so hot and thirsty with all the walking in the hot Florida sun. You can actually buy your wand online ahead of time, or purchase an interactive wand at Olivanders or Gregorovitch's. The interactive wands are $50 and allow you to perform spells at designated places around the park. Look for the brass plaques on the ground, and follow the map to tell you which spells to perform where. You'll get to practice alohomora and wingardium leviOsa (not leviosA) at the designated spots around the park. Be aware that the spells can be a little bit tricky, and you may not do it right the first few times. Remember: swish and flick! Small movements work better. It's all in the wrist! I'm so excited for you to experience the Wizarding World of Harry Potter for yourself! You're going to absolutely love every minute of it.